One of the added bonuses of a trip to Fan Expo Canada in Toronto is the opportunity to do a little sightseeing in Toronto — like seeing a few of the locations used in the filming of the BBC America / Space show Orphan Black. 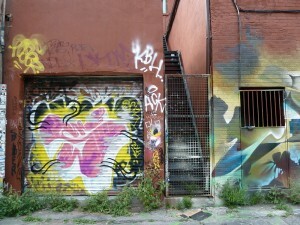 Within easy walking distance of the convention center we found both Beth’s Condo and Felix’s loft. The show Orphan Black is discreet about where it is set, not blatantly being in Canada, or even “the here and now” as some fans have put it. 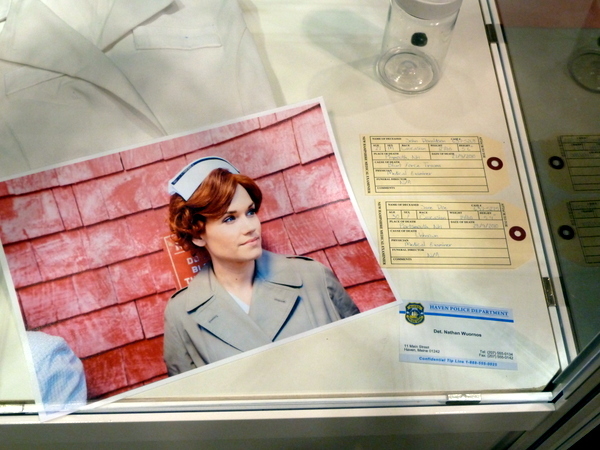 Some of the fans have paused on the scenes where we see birth certificates and other personal documents trying to get clues as to when and where the show takes place, but viewers can rest assured that if the powers that be wanted it to be clearly set in Toronto they would have needed to just shift the camera angle on Beth’s Condo by a hundred feet or more and voila… the CN Tower would have been clearly visible in the background and they mystery would have been solved. 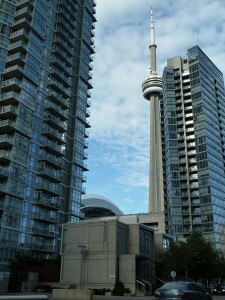 This was a quick and easy walk from Fan Expo, taking us past Rogers Centre / the Skydome and a Blue Jays game. 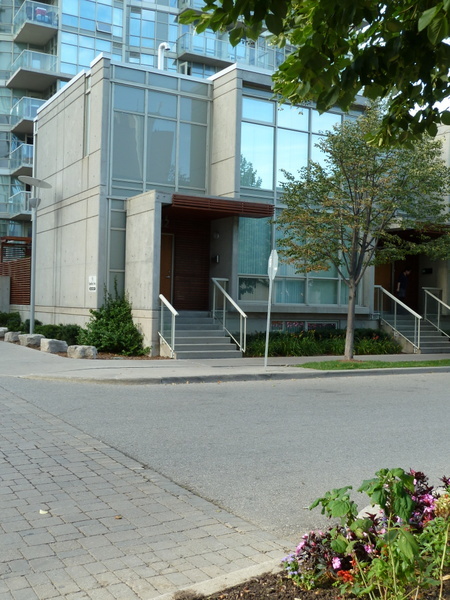 If you are an Orphan Black fan, and ever at a convention in the Metro Toronto Convention Centre… you just might want to consider swinging by Beth’s Condo yourself. Further afield, and a bit of a walk was Felix’s Loft, which has a different paint job than we were expecting, and a gate over the stairs, but we persevered and found it. 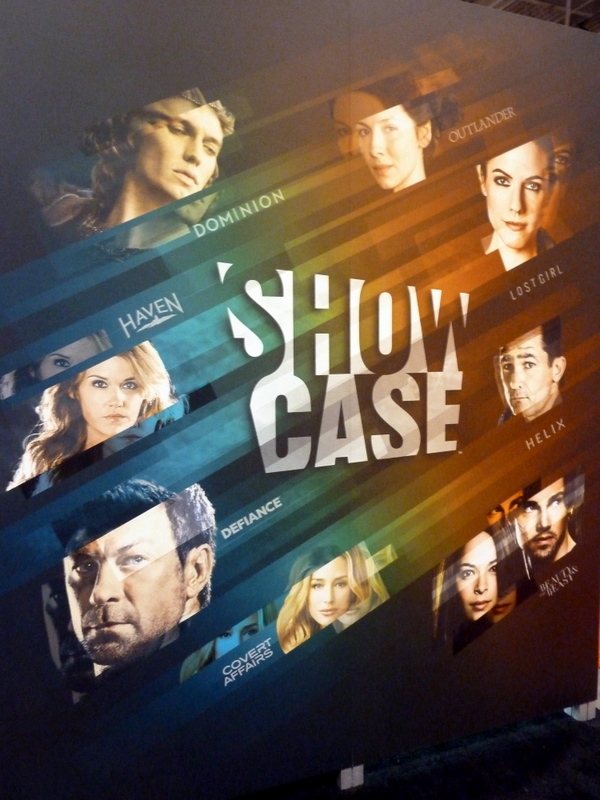 This entry was posted in Convention, Television and tagged Beth's Condo, CN Tower, Fan Expo, Fan Expo Canada, Fan Expo Toronto, Metro Toronto Convention Center, Orphan Black, PopArtsPlace, PopArtsPlace.com, Rogers Centre on August 31, 2014 by Kay. As we looked outside one of the windows during the walk between the North and South buildings of the convention center at Fan Expo Canada, on the top of a small rise in a park we saw a Tardis surrounded by fans! When we found our way outside it was surrounded by fans, we tried to take photos of it with the CN Tower in the background, but the light was not in my favor, and the CN Tower came out as a striking silhouette, and I know the shape in front of it is the Tardis, but I doubt anyone else would recognize it as that. I did however find an angle from which the Rogers Centre, otherwise known as the Skydome, could be seen in the background. 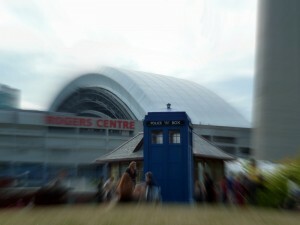 A little fun with the focus made for a whimsical photo, and helped respect the privacy of the fans enjoying the Tardis. 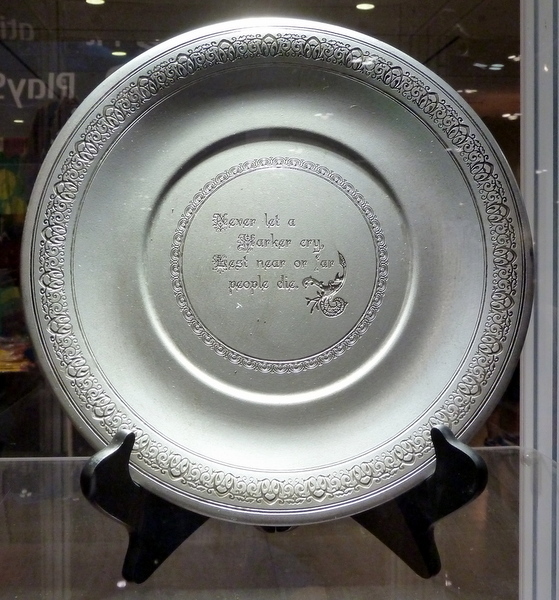 This entry was posted in Convention and tagged CN Tower, Fan Expo, Fan Expo Canada, Fan Expo Toronto, Metro Toronto Convention Centre, Rogers Centre, Tardis, Toronto on August 30, 2014 by Kay. This poster at the Showcase booth at Fan Expo is an eye-catcher, to the point I wish they were offering it as a give-away! WOW! And once again, in one image no less, they remind me why I wish I had showcase as a channel I received. Talk about one channel having show after show I love to watch. Today I enjoyed seeing friends greenscreened into a trailer for the show Outlander at the Showcase booth, scoping out Lawkeeper Nolans’ car from Defiance (he’s got nice wheels) and checked out displays with props from Haven, Beauty and the Beast, and Outlander. Among other highlights of our day was the Edward James Olmos panel, where he answered questions about Battlestar Gallactica, and other tv shows and movies he has been a part of, but the audience also asked him about projects that he openly admitted he did not expect to be asked about, but appreciated our interest in. His work for the environment, and with Public Broadcasting, and the Corporation for Public Broadcasting (PBS) in the United States. The panel alternated between moments of laughter that filled the entire theater, to very serious moments in which he discussed the entire cast of Battlestar Gallactica being invited to address the United Nations. This entry was posted in Convention and tagged Battlestar Gallactica, Beauty and the Beast, Defiance, Edward James Olmos, Fan Expo, Fan Expo Canada, Haven, Lawkeeper, Nolan, Outlander, PopArtsPlace, SciFi, Showcase, Showcase.ca, SyFy, Toronto on August 29, 2014 by Kay. The Showcase Booth had a wonderful exhibit of props from a variety of shows including Outlander, Beauty and the Beast, and Haven. 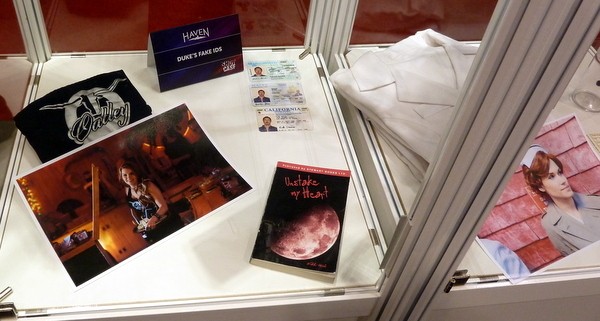 This entry was posted in Convention and tagged Fan Expo, Fan Expo Canada, Fan Expo Toronto, Haven, Showcase, SyFy on August 29, 2014 by Kay.